Singing “Ring Around the Rosy” is a favorite part of our baby and toddler swim classes. Would you like your baby or toddler to develop a lifelong love of the water? At Chicago Blue Dolphins, we help them do just that by using a child-centered approach for our infant-toddler swim classes. We use songs, games and toys to bring joy to the learning process, which helps the children learn faster and better and eliminates pressure, anxiety, crying and coughing. We introduce skills when your child is ready, open and relaxed. We take the tears out of the process and foster fun in learning. There are never any forced back floats, immersions or aggressive skills-based teaching. We adopted the child-centric philosophy nearly a decade ago, and the results have been amazing. When a child is happy and enjoying learning, the skills become ingrained in a positive way, and this leads to stronger, higher quality swim strokes as they develop. What Can You Expect from Our Baby and Toddler Swim Classes? How Old Are the Children in the Baby Toddler Swim Classes? These classes are for children from 6 months to 4 years old. We like to have mixed age ranges because each age group contributes in different ways to the class. As our older kids pick up more advanced gross motor skills, such as kicking faster, they serve as role models for the infants. At the same time, infants tend to put their faces in the water faster, showing the older kids that it’s not that scary. As a parent, you will be in the water and will be an active participant on your child’s swim journey. You will be your child’s “spotter,” helping him or her perform the activities safely and happily. We also teach you the skills you need to take what you learn in class and have fun with your little one in the pool, lake or ocean. If you’d like more information on our teaching approach and on the classes in our sequence, please refer to the presentation to the right. What Levels of Classes Do You Offer for Infants and Toddlers? All of our babies and toddlers begin in Infant Toddler 1 and work their way up to Infant Toddler 3. The amount of time that takes depends on the age of your child, whether they come to class once per week or more frequently, and the pace at which they become comfortable with the water and the skills they’re developing. For an in-depth look at our baby and toddler curriculum, check out our Infant-Toddler Roadmap. We keep the size of our classes small to give each parent-child more attention and practice. 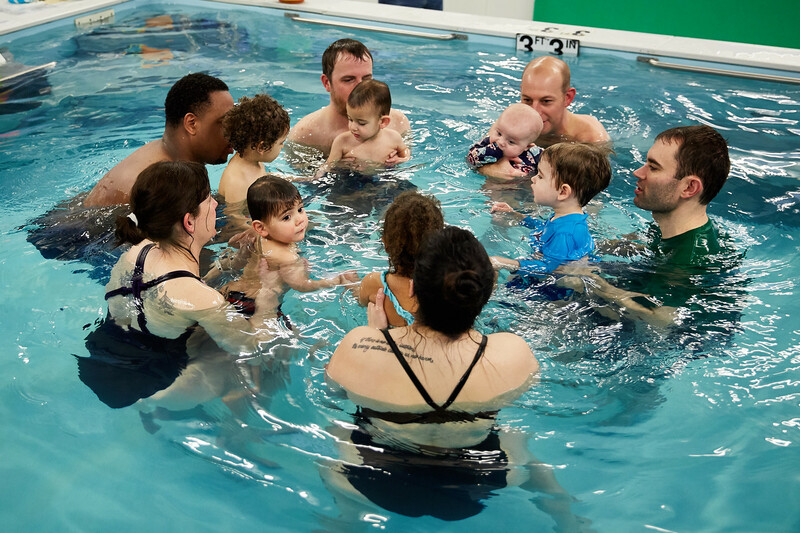 Our student-to-teacher ratio in our Infant Toddler swim classes is 5:1 maximum. Each Infant Toddler swim class lasts for 30 minutes. The time flies by, and at that age, half an hour in the pool tuckers the kids out. In our custom-designed Swim Studio, babies and toddlers swim in warm, comfortable Endless Pools. The pool sizes and warm water are ideal for our youngest swimmers (and you, the parent or caregiver!). As they get older, our Endless Pools will help your child learn faster and will make him/her a better swimmer overall. We ask you to start with a 3 month commitment to swimming classes at Chicago Blue Dolphins for your baby or toddler. We feel that three months is about the amount of time required to make an impact on your kiddo’s swimming skills. Within three months, most children are happy and comfortable in the water, able to hold their breath and glide for at least 1 second, and enter and exit the water safely. After the initial 3 session period, you will continue on a month-by-month basis. The monthly tuition for our Baby Toddler program is provided in the table below. For parents who want to speed up the learning process, we offer a 7% discount on tuition for additional weekly classes you book. If you withdraw your child from class within the initial three month period, you will be assessed a $25.00 cancellation fee. For more details about withdrawing from a class, see “Disenrollment from Automatic Tuition Renewal” on our Policies and Procedures page. When you register for a class, we charge your credit card that day for the first month of tuition. We will then set you up for automatic payment on the same day in subsequent months. We will keep you on auto pay until your child moves into a class with a different tuition or until you discontinue taking classes. If you withdraw your child from class within the initial three session period, you will be assessed a $25.00 cancellation fee. For more details about withdrawing from a class, see “Disenrollment from Automatic Tuition Renewal” on our Policies and Procedures page. How Do Parents Rate Your Classes? Do You Offer Private Lessons for Babies and Toddlers? Sorry, but we do not offer private lessons to this age group. Private lessons are available at the age of 4. Here’s the full class schedule for our Infant Toddler swim classes, which are held at our Swim Studio. Click the Filters “three line” icon to filter the results by day of the week, time of day, class and instructor. We ONLY offer online registration for the entry-level class, Infant-Toddler 1. If you see a SIGN UP button next to the class name, there is space available and you can register online. If you would like to register for a more advanced class, schedule a make-up, or put yourself on a waiting list for a class that’s full, please contact our office. Please note that we ask that you initially commit to 3 months of classes when you sign up. You will only be charged for the first month when you register online with the other two months charged on the second and third months after your class start date. You can cancel within the 3 month period, but you will be charged a $25.00 early cancellation fee.